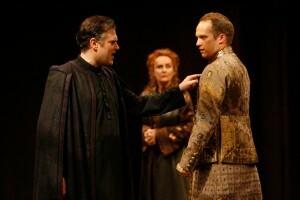 I, like almost everyone else, had never seen The Winter’s Tale before this year at the Stratford Festival . I’d read it, discussed possible stagings, and analyzed the characters, but never seen for myself the play with 2 worlds. That, I suppose, is a theme at Stratford this year: 2 contrasting worlds in a single story: As You Like It has the court and Arden, Peter Pan has Neverland and the Darling home, The Tempest has the wild island and the unseen Milan, there’s the two Italian cities of Two Gents, The private and public worlds of Dangerous Liaisons and Evita, even the stage and backstage realities in Kiss Me Kate. 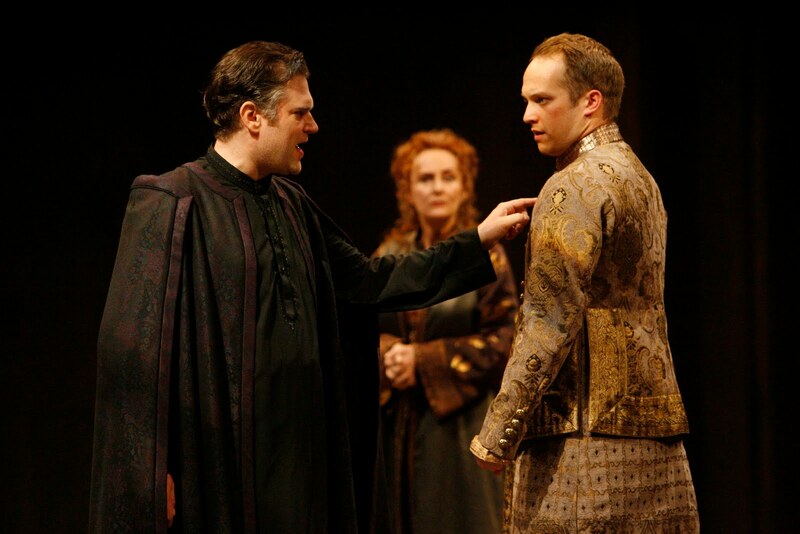 But perhaps the most pronounced contrast is in The Winter’s Tale, directed by festival veteran Marti Maraden. Maraden and designer John Pennoyer create two vivid and entrancing worlds, each rich in detail though somewhat unmatched in poignancy. First there’s Sicilia, the cold and tethered world where Ben Carlson’s complex Leontes reigns with more power than is comfortable. Sicilia is also a showcase of classical talent. The generally strong Carlson is particularly good as the jealous ruler, spinning out of control quickly then slowly building up a layer of empathetic remorse. This is the best I’ve ever seen Yanna McIntosh, her Hermione is strong but just warm enough to stir her husband’s irrational jealousy when he sees her camaraderie with his friend Polixenes. Seana McKenna is perfection as Paulina, the most interesting character in the play. The way she prods at the guilty Leontes is righteous and justified but with an excellent dash of cruelty in retribution for his crimes against her friend. While the classical pedigree of the actors playing Sicilians brings an interesting sense of method to their world, the musical background of many of the actors playing Bohemians brings a lightness and fun to their performances. The ever-charming Dan Chameroy is particularly warm as Polixenes and Mike Shara is wonderfully funny (outright hysterical at times) as the Young Shepherd. The fun of Bohemia, so forbidden in Sicilia, is seen particularly in Tom Rooney’s petty thief Autolycus. Bohemia is a world where everyone is dressed in silly-looking hats and bright colours. They dance, they sing, they certainly joke, and even their criminals are fairly harmless. The always-excellent Rooney drives home the contrast of the worlds in being a lovable “villain” while Sicilia’s own king is as cold as they come. With the exception of Cara Ricketts, who plays Perdita with about as much brain activity as a set piece, the cast is wonderfully energetic and watchable. Randy Hughson as Time is particularly fascinating, seemingly suspended in midair as he delivers his single monologue marking the passage of 16 years. There are times when Bohemia seems a bit too lovely perhaps, and one begins to wonder if those who live there are missing something. Sicilia, on the other hand, as bleak as it may be, achieves some really poignant moments of happiness that make the tragedy all the more alarming. The contrast of these worlds gives the well-executed play lots of dynamics but while Bohemia can be one-note, Sicilia stands on its own as a singularly complex world.